It would seem Gibson has at last turned a corner in terms of quality and consistency. Not only is the ES-339 a great guitar at an even better price, it's undoubtedly one of the best new Gibsons we've ever played. Everything – concept, build, finishing and sounds. Heavier than a classic ES-335, but we can live with that. Celebrating its 50th birthday in 2008, Gibson's ES-335 is rightly considered an electric guitar icon. Unlike the Les Paul, which went through numerous changes before the Standard was born in 1958, the ES-335 was perfectly conceived from the off. Yet that hasn't stopped Gibson tinkering with the design over the years. And if there is a criticism of the ES-335, it's that it's just too big for many players. 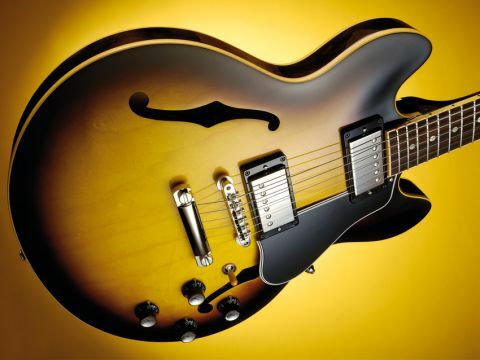 Most recently Gibson addressed the dilemma with the ES-336 (which became the still available CS-336) launched, ironically in terms of the UK market, in 1996 at the height of Britpop when sales of the original-style ES-335 and Epiphone semis were at a high point. The ES-346 followed a year later (technically still available in the form of the Paul Jackson Jr signature). Both are downsized semis but, unlike the ES-335's maple laminate construction, the back is channelled out from solid mahogany and the top from solid maple. "You'd better get in the queue behind us before, in terms of price, someone at Gibson realises they've made a terrible mistake. It really is that good." Move on to 2007 and out pops the ES-339 from Gibson's Memphis Custom Shop, similar in size to the 336/346 but made from maple-faced laminate top, back and sides with a maple centre block - a mini version of an ES-335. Measuring 362mm (14.25-inches) wide and 425mm (16.75-inches) long, the ES-339 is smaller than the 406mm (16-inch) x 483mm (19-inch) ES-335. Rim depth is virtually identical at just under 44mm (1.75 inches). It's made in almost exactly the same way: the pressed, lightly arched laminate top and back glued to laminate sides, the gluing area increased by tidily kerfed linings. The ES-335's masterstroke, its centre block, is retained here too: mainly maple with spruce 'cushions' between the arched top and back. It's all tidily done and clearly visible through the f-holes, which are unbound, but have the edges - and the otherwise visible laminate layers - nicely disguised with a matt black paint. Finishing can be very variable on modern Gibson guitars. The company still uses nitro-cellulose for all but its start-up models but here, not only is the old-style sunburst perfectly coloured (black to deep brown to a golden yellow centre, the single strip edge binding a beautiful nicotine coloured vintage hue) but also highly glossed, if not technically as mirror-flat as we've come to expect from other USA brands. A problem? Not at all. The one-piece quartersawn mahogany neck is left 'natural' (probably coloured a deeper brown by the grain filler) once the 'bursting over the tidy heel fades away; the head is back-angled 17 degrees and faced in jet black with the classic pearl inlaid, and slightly yellowed, brand logo and crown motif. The tuners suit the vintage vibe: Gibson Deluxe logo'd Kluson-style with slightly too dark and opaque 'tulip' buttons. The obvious quality continues with the deep purple-tinged brown Indian rosewood fingerboard with quite chunky and tall wire (approx 2.29mm x 1.3mm) that's really well rounded and finished - not always the case with modern production Gibsons that seem to have virtually square section frets. This is the result, it seems, of using the computer-controlled Plek machine to level and finish the frets. Gibson is one of the few to add the binding after the 'board is fretted, resulting in a 'nib' of binding at each fret end. The binding thickness is greater than on a vintage model so this method not only reduces the playable width of the 'board but those nibs can come away from the fret and you can find the high E falls into the gap. But not here - the nibs are dressed away and while that doesn't alter the slightly narrower width, it feels fine. In terms of overall shape the ES-339 is offered with two neck sizes: "a 30/60 neck has the slim, wide feel of an early 1960s Gibson, with an extra 0.030-inches of depth," says Gibson. The second is "a heftier '59 neck profile". It's the latter we have here: in depth it's 23mm at the first, 25.6mm at the 12th - a big feeling neck with rounded shoulders and a slight flat to the back. The hardware and electrics are what you'd expect. Two covered '57 Classic humbuckers are the pickups of choice, and the control layout is the same as an ES-335 except the output jack is side-mounted, which will be a plus point for many players. Gibson advertises, however, that: "the 339 also sports Gibson's new Memphis Tone Circuit, which preserves the guitar's high frequencies no matter where you adjust the volume control. Strapped on the ES-339 certainly feels less bulky, more 'solidbody' if you like, and more manageable than a 335. The cutaways are a little tight, perhaps, so this may not really be the guitar you'd want if you spend all night up the dusty end. For most of us, however, that's not an issue. Strung with 0.010-0.046-inch strings there's a nice fight to the guitar, a clean action and a roomy, quite loud acoustic resonance. At 4kg (8.75lb) it's not the lightest ES-335-style guitar we've ever played and is certainly a heavier build than an early original. But when you plug in, the additional air is immediately apparent creating a more open, dynamic tone with plenty of highs, roomy lows and less one-dimensional solidbody grunt. If a modern ES-335 sounds more 'solidbody' than an early original, it actually works in the ES-339's favour: not only is the design an ES-335/Les Paul mix, so is the sonic performance with a marginally more 'solid' tone and a tighter, less wide bass end than a modern ES-335. The '57 Classics are well known pickups and drop us immediately into classic Gibson territory: thick but not over dark at the bridge, soupy and smooth at the neck and an open, twangier tone from the mix that to this writer's ears always works better on a ES-335 than a Les Paul. Playability is very positive with those well-rounded but tall frets giving plenty of height for gymnastic bends, hammer-ons and pull-offs. Yes, you can slip off the treble side more easily than with a full width fret, but it's something you soon compensate for. It's less dynamic than an old ES-335, and more modern sounding, but it's still more expressive than the all-solid Les Paul. If you've previously found modern-spec Gibson electrics a little under par when it comes to volume and tone control tapers, you're in for a treat here. The control tapers are smooth and if you use your volume control as an effect you'll find at lower volumes it sounds just that little clearer; if you want to clean up your tone by reducing your volume it doesn't darken or soften the sound quite as much. It's subtle but, again, this helps in the mix position where altering the pickup volumes and tones is all about subtlety anyway. Despite the centre-block an ES-335 is easy to edge into (hopefully) musical feedback and the ES-339 is no different, albeit in theory it should be a little harder to achieve that style of effect simply due to the smaller, and therefore slightly stiffer, unsupported top and back surfaces. Put simply, the changes and overall design have quite a profound effect. No longer do you feel 'dwarfed' by the size, and with controls that feel smooth and sound clean at lower settings there are just more sounds to be had before you even begin touch your amp or effects. For many players the ES-335 is perfect in both appearance and function - in which case you won't be interested in this guitar. But for those of us who simply can't get on with the size, the ES-339 is the best-yet compromise - an ES-335 for the solidbody player, perhaps, but one that retains the character of the modern larger-bodied model with improvements to the controls that allow a broader range of more useable sounds. Add in the much sharper-than-normal workmanship, set-up and that oh-so-classic finish and you have a guitar that sounds, feels and plays as good as it looks. Then there's the price. With Gibson's new distribution network, prices have changed (for the better) but even so, this ES-339 seems like a steal, especially when you consider its Memphis Custom Shop origins and its overall quality. We strongly suggest you track down one of these guitars - you'd better get in the queue behind us though - before, in terms of price, someone at Gibson realises they've made a terrible mistake. It really is that good.